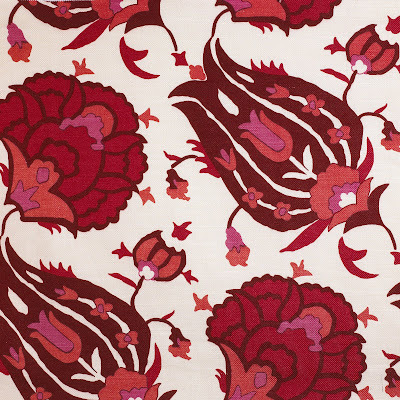 Above, "Turkish Flower," in red on linen, an original David Hicks design inspired by a silk kaftan in the Topkapi Palace wardrobe. "La Fiorentina" in coral; "Cliffoney" in salmon/wheat; "Waistcoat" in salmon: "Axum Stripe" in coral/sand; ""York Castle" in salmon; "Kyoto Shrine" in salmon; back fabric is "Coggeshall Solid" in salmon. Above, "Daisy, Daisy," a geo-floral on cotton/linen that David Hicks first designed in 1961. 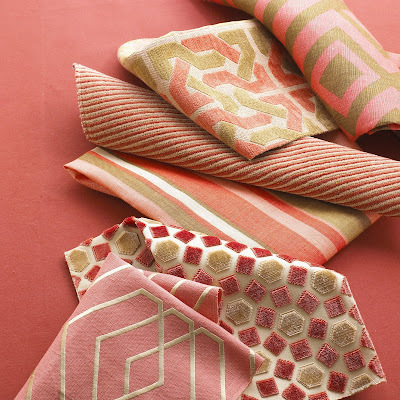 This fall, Groundworks will launch a second geometric fabric collection by Ashley Hicks. Again, the line is designed in the style of Hicks's iconic dad, David Hicks. But this time, Ashley's own vision is more dominant with bold geo-florals and geometric figures, and up-to-the-minute color colorways. Above are just a few prints that caught my eye. 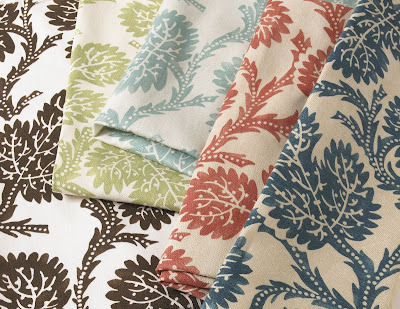 Check back for more fall fabric previews over the next few days. 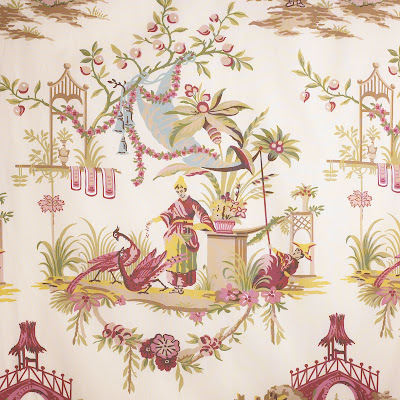 Above, "Folie Chinoise," is an overscale French chinoiserie print, on all cotton, adapted from a mid-century French design. Rheinstein sees this as ideal for a large wing chair. 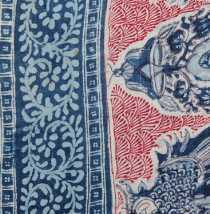 Above, "Dotted Leaf," the most graphic pattern in Rheinstein's collection, was inspired by an 18th century English indigo resist print. Above, "Ikat De Lin," a large scale print on handwoven linen. 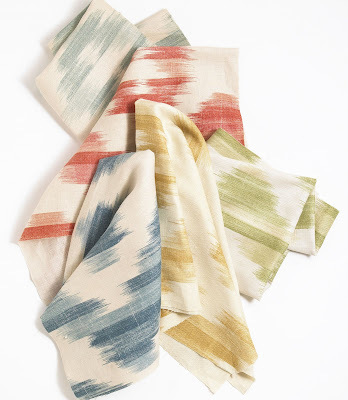 "Sensuous and comforting" is how Suzanne Rheinstein describes the translucent colors she chose for her debut collection of fabrics designed for Lee Jofa. The line is set to launch in the fall. Expect to see Rheinstein's signature milky aquas, warm honey tones, bronzes and gray-greens. Above are a few of my favorites. Not surprisingly, I especially adore the large scale "Folie Chinoise." Unapologetically Pretty. 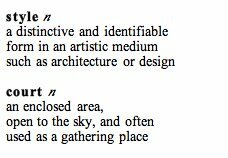 Recently I saw that phrase used to describe an apartment. If only I'd been clever enough to think of those words when I named this blog last year. Well, at least I can create a regular feature using the headline. These rooms above, decorated by Emma Jane Pilkington, fit the category perfectly. Above, a David Hicks geometric pattern on linen, "La Foirentina" in Ivory/Bark, is just one sample from the many great liscensed collections produced by Groundworks, a division of Lee Jofa. If the pattern looks familiar, you probably spotted it on the June/July cover of Domino; India Hicks has living room chairs covered in her legendary dad's fabric. 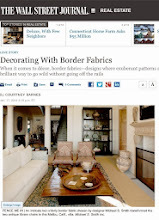 An impressive list of interior designers have licensed collections produced by the fabric houses, Lee Jofa and Kravet. The stellar line-up includes Alexa Hampton, Ashley and Allegra Hicks, Suzanne Rheinstein, David Easton, Barbara Barry, and Thomas O'Brien -- just to name a few. Fifteen of these talents will be featured in an upcoming book, Inspired Styles, scheduled to be released by Assouline in time for holiday gift-giving 2007. I've been told the book's focus will be on timeless rooms, and what inspires these diverse designers to create them. 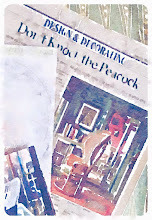 In case you missed this in Domino, The Decorator’s Secret, located in Stamford, Connecticut, offers a vast array of home furnishing samples, such as panels of Gracie handpainted wallpaper. 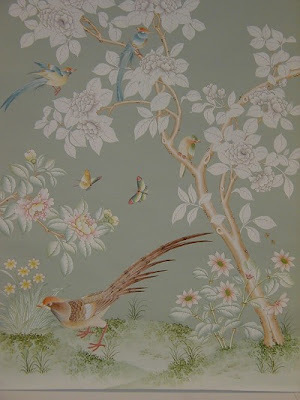 The panel shown here, above, is approximately 36" x 120". The other day, I mentioned a line Mary McDonald once said, "If David Hicks and Nancy Lancaster were married -- that's my style." As an afterthought, I wanted to share this dining room done by McDonald, for her own home. 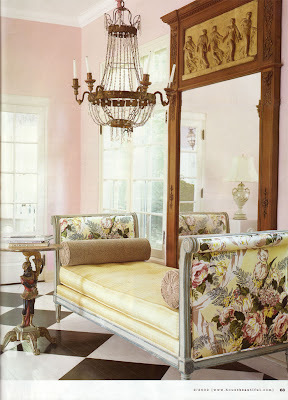 To me, it totally reflects the quote, mixing graphic Hicks-ish chairs with Lancaster's softer, feminine look. Photography above, Melanie Acevedo for House & Garden, November 2001. 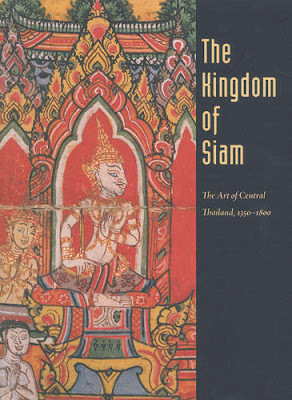 As its name implies, Art Media Resources, a publishing house specializing in Asian art, is in fact a great resource for anyone with a serious interest in the subject. Above and below are some titles that caught my interest. 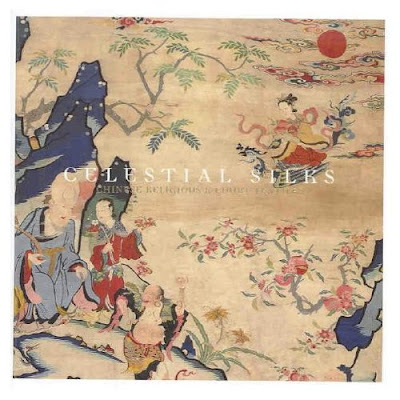 The publisher's catalog also includes a book entirely focused on the evolution of Chinese lacquer and its use on traditional screens: Coromandel Lacquer Screens. 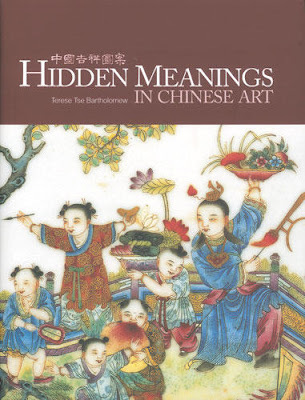 Prices for Hidden Meanings in Chinese Art seem to be all over the place -- from $75 to over $150, depending on where you look. I've seen the book on eBay and on the publisher's site priced under $80. 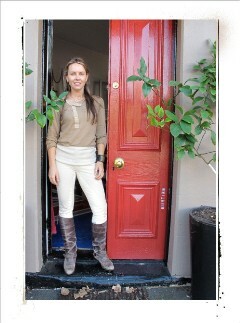 Rebecca Vizard is a passionate collector of antique textiles. 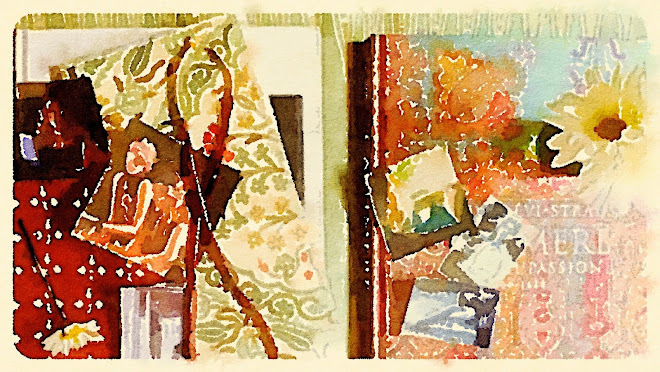 She travels the world looking for 17th, 18th, and early 19th-century fragments, then brings them home to Locustland Plantation in St. Joseph, Louisiana, where the fabrics become pillows. 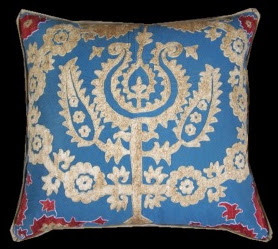 Recently, Vizard began designing pillows made from antique suzanis. 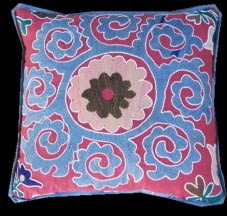 The pillow shown top is made from a hand-embroidered classic Samarkand suzani, from Uzbekistan. 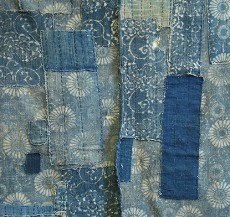 The second, also crafted from an old suzani, is backed with chambray. Prices range from around $200 - $600. 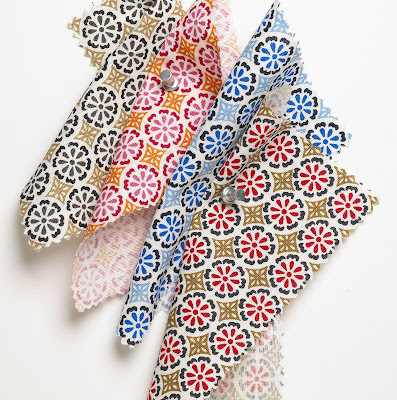 For a much smaller price, around $35-$50, Vizard offers the loveliest six inch Christmas stockings made from antique textiles. These usually become available online in the fall. 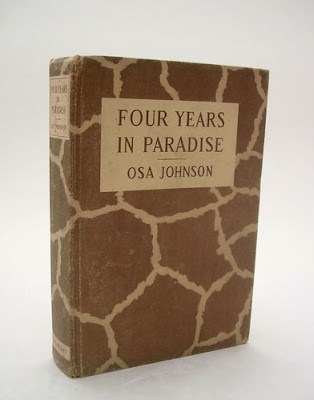 Above, a hardcover first edition of Osa Johnson's 1941, Four Years in Paradise, with the striking and rare giraffe print cover, is currently available through Paris Hotel Boutique. 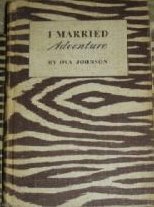 This book was the follow-up to Johnson's earlier title, I Married Adventure. 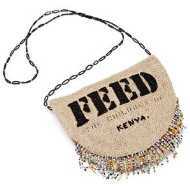 Recently, Megan, of Beach Bungalow 8, did a great post, You're So Stylin', about accessories and books that have become omnipresent in design mags and catalogs. (Megan creatively offered some alternatives too.) 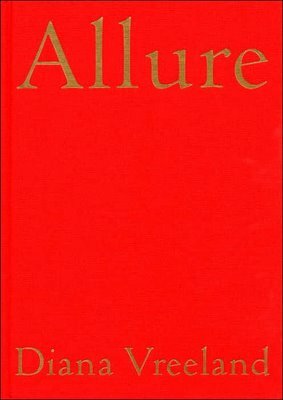 Her post reminded me of something I wrote last summer, on those oft-seen books: Diana Vreeland's Allure, and Osa Johnson's I Married Adventure. These titles must surely be the top two seen on coffee tables, in homes photographed for shelter magazines. 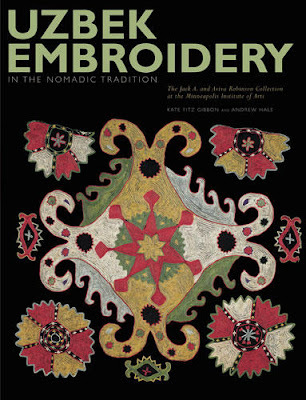 But I see the appeal -- both are interesting books with highly decorative covers. It's an intriguing phenomenon. Maybe there is a collective design unconscious. 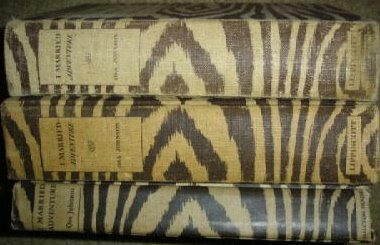 To find Johnson's book with the original zebra printed cloth binding, try eBay or Paris Hotel Boutique. A few weeks ago, I finally picked-up my own copy of Tibet Style. I expected to see fashion photographer Yann Romain's incredibly lush images of Tibetans in their colorful silks, chunky coral jewelry, and leopard-trimmed coats. But the straightforward text from Hippolyte Romain surprised me. 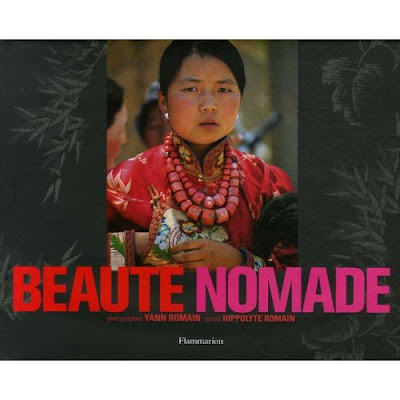 The author balances the book's extravagant pictures with brief words on the West's romanticism of Tibet, and on the realities of modern life there. Whether you are interested in learning something new, or simply want to be inspired by rich combinations of color and texture, Tibet Style. is a nice resource. When I see the Tibetans' passion for coral, turquoise and leopard, I can't help thinking of Tony Duquette. BTW: A few months ago, Domino, created a room inspired by this book. Above is the French version, with my favorite cover. 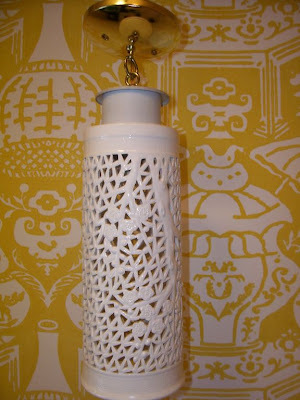 It's no big surprise that I'm drawn to this circa 1950s pierced porcelain hanging light from Pariscope. 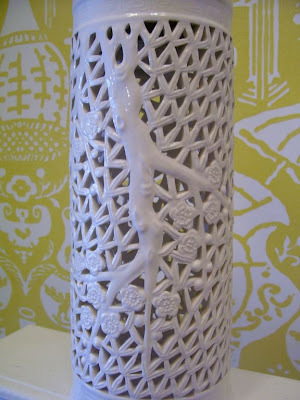 I already have a very similar table lamp (can't resist that Ming tree design). But seeing this style in a ceiling fixture is a first for me. 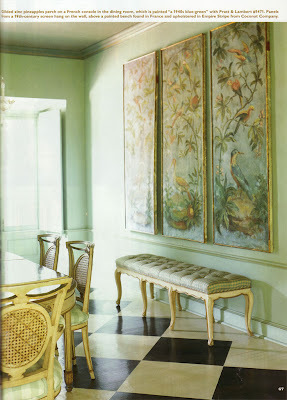 You may remember the home of Pariscope's owner, decorator Madeline Ward Roth, from House Beautiful, February 2002. Madeline was a little ahead of the curve with her passion for 1940s French chic and Hollywood Regency. Photography below by Dana Gallagher. BTW: The elegant entry and dining room, shown above, to me represent Madeline's best work. These rooms feel as if they would work in a Philip Trammel Shutze-designed home. 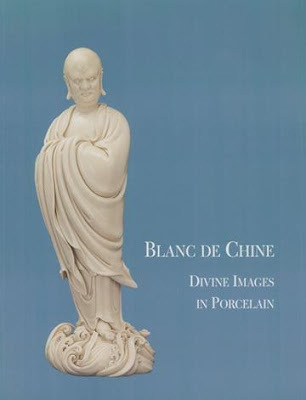 To learn more about Blanc de Chine, and Asian ceramics in general, visit Gotheborg.com. 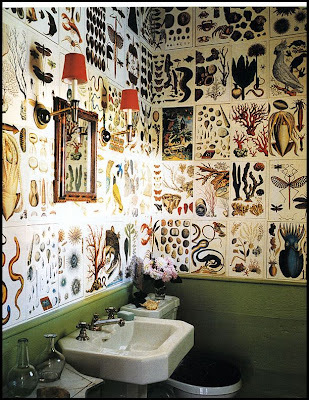 Above, Steven Gambrel papered an entire bath with pages from Taschen's Cabinet of Natural Curiosities. Photograph by William Waldron for Elle Decor, June/July 2004. Sam Flax Atlanta, the brick-and-mortar art supply store located at 1460 Northside Drive, has a great selection of books published by Taschen. 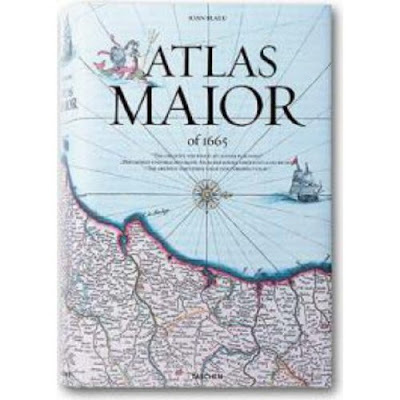 There are stacks of the mammoth editions, The World of Ornament, and Atlas Major, as well as the inexpensive ($9.99) Icon series, including China Style. If any of the larger pricey volumes are on your wish list, it's so helpful to peruse the books in person. 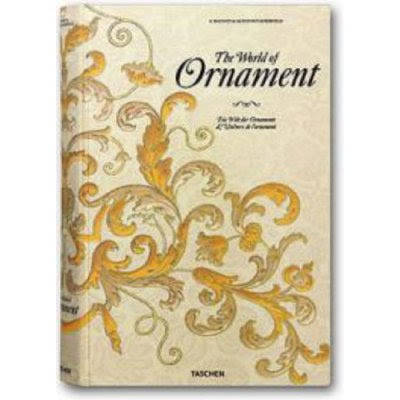 I'm still thinking about adding Ornament to my library. It comes with a DVD-ROM of high-resolution images of individual ornaments that may be reproduced without copyright restrictions. To reach Sam Flax Atlanta call (404) 352-7200.